Print out your party invitations! Online reservations are accepted 24hours a day. Please allow 1 week minimum advance notice for all parties. An email confirmation will be sent to you within 72hours. If additional information is needed in order for the O’Reilly Group McDonald’s to book your party, a representative will contact you via phone or email. Telephone reservations are accepted Monday-Friday 10am-4pm. Please allow 1 week minimum advance notice for all phoned in party reservations. $79.99 + tax for up to the first 10 children. $7.10 + tax for each additional child. Payment will be made at end of party at the McDonald’s location. If making your reservation online, the system will ask for your 1st & 2nd choice of time for your party. 72 Hour Notice or More – email Birthdays@OreillyMCD.com or call 972-985-9285. Less than 72 Hour Notice – contact the McDonald’s location directly and speak to the manager. 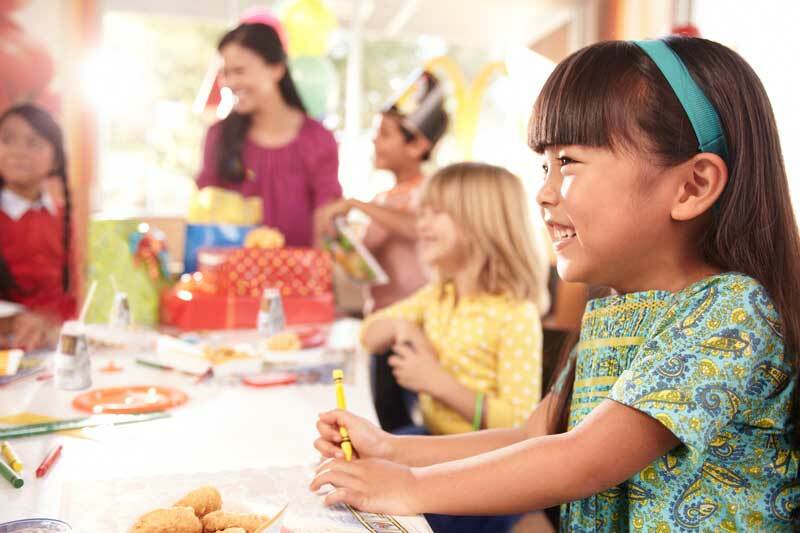 Birthday parties are located within the indoor playland at all of our McDonald’s® locations. One side of the indoor playland is reserved and decorated for your group. The other side of the playland and the crawl toy must remain open to the general public at all times. At the Hwy. 75 location in Allen, TX, parties are held in a private room. Maximum capacity for private room party is 20. A host/hostess will set up the party area, take the food orders, serve food, serve cake/ice cream, hand out goodie bags and a gift to the birthday child. At the end of the party, they will ring up the party and clear any additional trash created from gift opening. If you require a bi-lingual or Spanish speaking host/hostess, please notify us at time of reservation. A Ronald McDonald and friends theme is used in decorating. If you wish to decorate in another theme, it is permitted but does not change pricing. Latex balloons might be used in decorating. If so, they are for decoration purposes only and may not be distributed to guests. If latex allergy exists, please notify host/hostess that you wish to exclude balloons. Party package includes a regular Happy Meal® for each child. Choice of Hamburger, Cheeseburger, or 4pc. Chicken McNuggets. Side choices of yogurt or apples. Drink choices of milk, apple juice, or fountain soda. Food orders will be taken at the beginning of party by host/hostess. Adult meals for parents/chaperones must be purchased separately at the front counter. You get your choice of a chocolate or white cake. All cakes are decorated with a white whip icing, yellow and red border, and a Ronald McDonald decal on top. You may bring your own cake if you wish. Bringing your own cake does not reduce the party package pricing. Parties of 21 people or more will receive 2 cakes of your choice. Each child also receives a small vanilla ice cream cup. Each McDonald’s® receives these items directly from our distribution company. The items included in the goodie bags change weekly and is not known until party time. If you need goodie bags designed for children under 3, please notify manager upon arrival on party day. Gifts for birthday child also vary. Ronald McDonald does not make guest appearances at birthday parties. We strongly discourage the scheduling of outside entertainers at the birthday parties. The parties are held in the PlayPlace where other families and children are nearby, and they tend to move in on your event not realizing it is a private party.